Hotel Pine Havens is situated in Kumaon region of Uttarakhand state. In the lap of nature and amidst salubrious environs, Pine Havens serves travelers with tastefully decorated and spacious rooms. The rooms are equipped with modern amenities and style architecture and furnishing. The Pine Havens offers a panoramic view of the verdant valley and the splendid Himalayas in Kausani. Serene Surroundings and the rhododendron forests bring you closer to nature. Pine Havens has 21 rooms and a restaurant serving delicious and healthy food. The hotels from this group are: Pine Havens in Kausani, The Corbett Aroma Havens Resort in Corbett. Pine Havens is located near UCO Bank in Kausani. 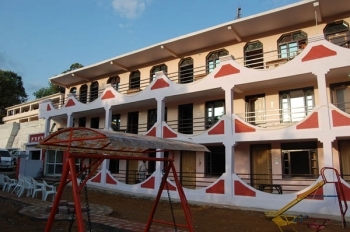 Pine Havens Hotel in Kausani serves 21 rooms ensuring comfort at its best. The rooms are categorized as Deluxe, Super Deluxe and Family rooms. All rooms have attached bathrooms with running hot & cold water. In-room amenities include cable television, direct dial telephone, sofa unit, study table and safe deposit locker. DVD player, fruit basket, mineral water and iron & ironing board are available on request at an additional charge. The in-house multi cuisine restaurant of Pine Havens Resort serves Indian, Chinese and Continental delicacies. The resort also has an open air café where you can have snacks, tea and coffee. Room service is also available for the convenience of the guests. Open air cafe at The Pine Havens is for that nature lover who wants to enjoy the nature with a cup of tea. Enjoy the chirping sounds of the birds while you enjoy some hot and cold drinks at our open-air cafe. The Pine Havens resort has various activities for its in house guests. The adventure activities like rock climbing, Rappelling, Valley Crossing, one day trek, Over night camping and corporate management programme can be organicsed on the additional cost. - Well appointed Valley facing Rooms (Not to Himalaya facing) for 02 Nights. - Morning tea, American/Indian Breakfast and Dinner (MAP) on Menu Plan. Kausani is well connected by motorable roads with major towns of Uttarakhand state. Pine Havens in Kausani is located 53 kms from Almora, 79 kms from Ranikhet, 120kms from Nainital and 410 kms from Delhi. The nearest airport to Kausani is Pantnagar situated at a distance of 178 kms. The nearest railhead is Kathgodam located 142 kms from Kausani.